This morning we were supposed to do a landing to see more walrus, but when we get to Poolepynten where they normally gather, they are simply not home. Rather than hanging around we decide to set course for our afternoon’s excursion and have more time there. It also gives everyone a chance to catch up on diaries and spend some time reading or simply relaxing. In the early afternoon we reach Alkhornet for the excursion. The kayakers go out in our boats first, with the plan being to land our kayaks on the beach below Alkhornet and from there walk up to see the reindeer. The rest of the guests go straight by zodiac and will get to spend more time with the reindeer, with some becoming the object of curiosity for some young reindeer, who venture up very close to them (I’m looking at you, Tracy!). Today I have opted for a single kayak, but the conditions were not very conducive for it. Here in the mouth of Isfjorden, the waves are a bit choppy and are joined by a substantial swell, which makes me feel a bit vulnerable in the slightly less stable kayak, compared to the double kayaks. Valerie, our guide, asks me how I’m going and I tell her I’m living on the edge. But I stay upright and eventually settle in. But with the wind and wave conditions it is a lot harder work to keep up with the double kayaks and I lag behind the group as we cross the fjord and am the last one to beach the kayak. We walk uphill in our dry suits and neoprene booties on the spongy mosses that line the hills here. We go past the Sysselmannen’s hut, which is now no longer inhabited – the official tourism season having ended already. And before too long we see the reindeer peacefully grazing on the slopes under Alkhornet, a 427m mountain that looms like Mordor above us. 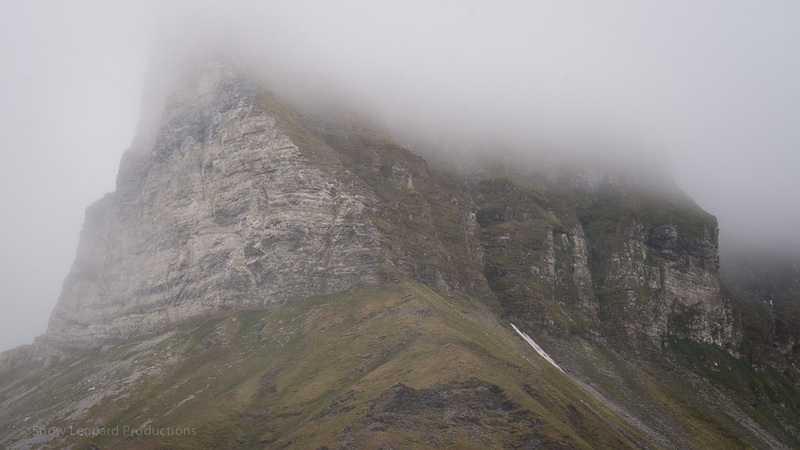 On the cloudy day the effect is particularly atmospheric, coupled with the cries of Arctic terns and other seabirds that nest and breed on its steep faces. We couldn’t have timed our exit from the water better, as within 20 minutes of beaching our kayaks the wind is picking up to 25 knots and the weather deteriorates rapidly. We beat a retreat to the ship in a choppy zodiac ride. Once everyone is back on board John informs us that the decision has been made to leave Svalbard early and sail for Greenland. 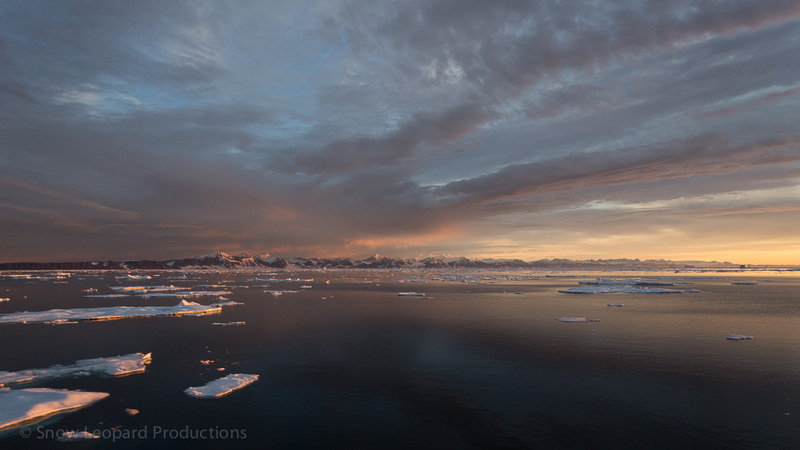 The intention is to keep the stormy winds to our back and set a course straight across to Greenland until we hit the ice pack and then head south with the Greenland current in our back until we reach Scoresby Sund. And so commence our sea days. It doesn’t take long for the seas to grow heavy and most people head to their cabins, pop some seasickness medication and go to sleep. I’m in dreamland before I know it and stay there for as long as I can. The next morning the ship is doing the ‘potato chip’, or like a corkscrew, if you will, and the best position is to stay horizontal. I skip breakfast and lunch, but I manage to get upright for dinner. By then the seas have calmed a bit from the Beaufort 6/7 they were, but the ship is still moving a lot. Another Phenergan after dinner and dreamland beckons again. On the second sea day the seas have calmed down substantially, so much so that I’m up for a shower and for breakfast. Today I can read, catch up on downloading photos and listen to talks given by the expedition team, although I still struggle with the sleep-inducing effects of Phenergan. It is interesting to see how our group of 75 passengers is starting to form small sub-groups. Where in the first few days everyone socialises with everyone, gradually you see small clusters forming, like cells splitting off from a major organism. It’s a logical development as it is impossible to socialise with everyone and people inevitably are drawn to like-minded souls. 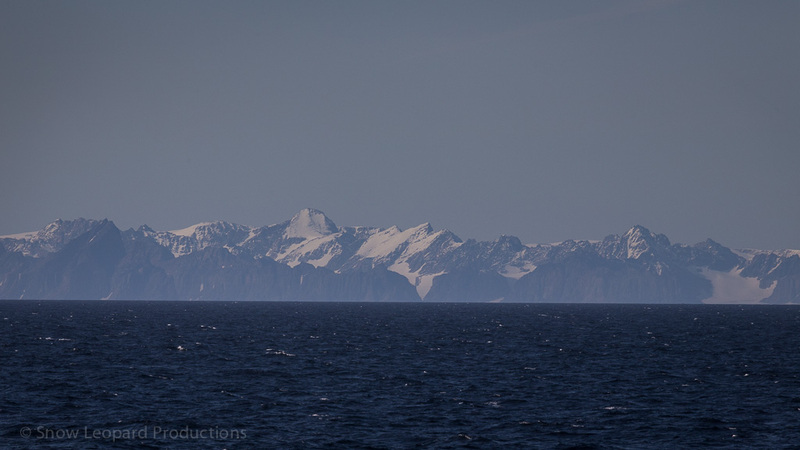 On the third sea day the weather is finally clearing and the fog that has surrounded the ship for the last two days is lifting and we are seeing the coast of Greenland. Everyone is up and about again and peering through binoculars at the coast, marvelling at the sea ice around us and looking for polar bears and whales. 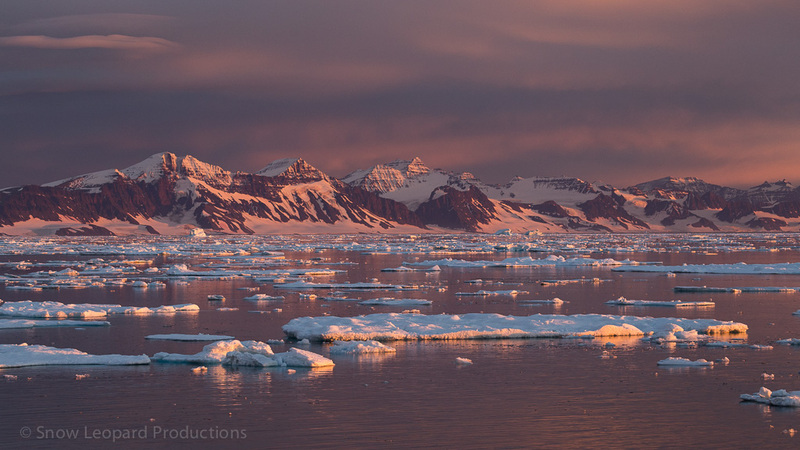 It is a magnificent sight this coast, sheer cliffs alternate with glaciers and ice caps and are framed by a dark blue sea. We are due to reach Scoresby Sund tonight at around dinner time. After three days at sea I can’t wait for some new action and more opportunities for photography. 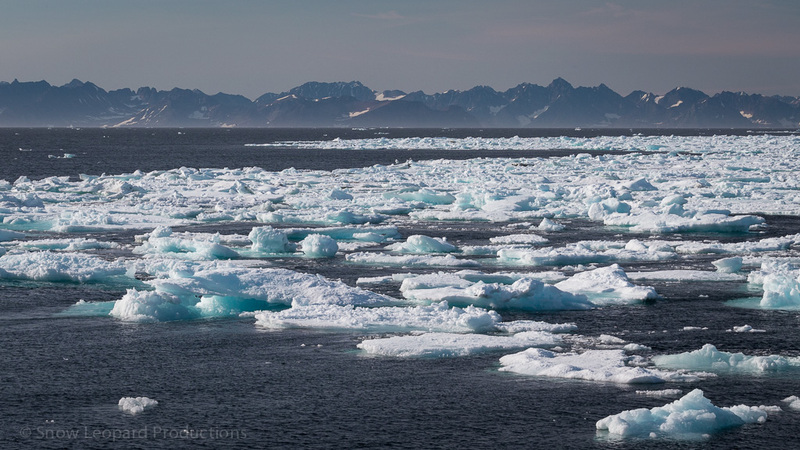 As we cruise close to Scoresby Sund we encounter a lot of drift ice, small and larger pieces that have broken off a larger ice sheet in the last 24 hours. 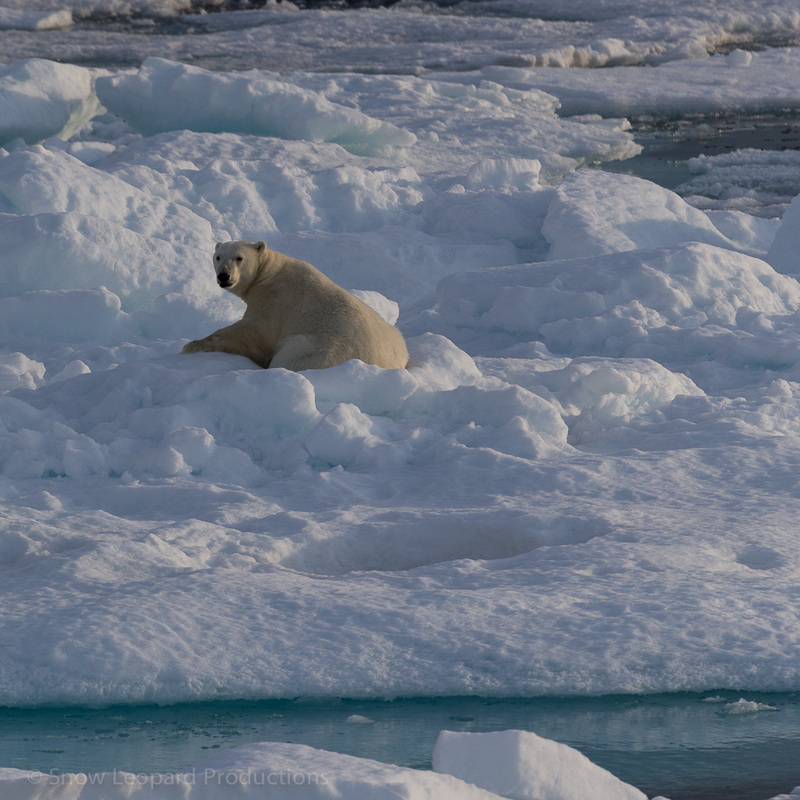 Just as we have sat down to dinner and put our main course orders in the announcement comes through that a polar bear has been spotted about a mile ahead of the ship on an ice floe. I don’t hesitate for one moment and I dash from the dining room to grab my camera and warm coat and rush upstairs to the panorama deck. After some time trying to spot the bear, I see him on one of the larger pieces of ice, asleep. As the ship very quietly slides closer, he suddenly becomes aware the ship bearing down on him. 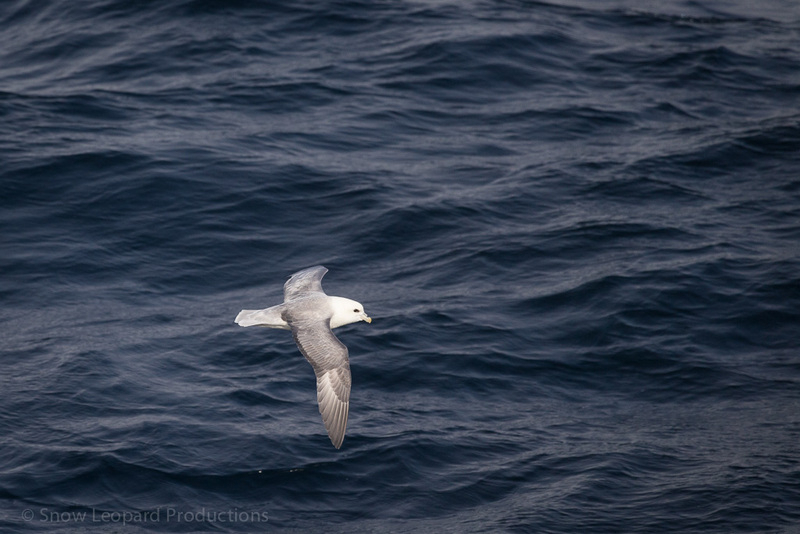 He glares at us before getting up fully and he starts running away, jumping from floe to floe in an effort to create distance between himself and the ship as fast as possible. Through my lens I can see he is a big bear with a beautiful thick and clean coat and well rounded in all corners. This bear has had sufficient food this summer and looks very well. When he finally feels he has put enough distance between us and himself he sits down on his hindquarters and stares at us. After the excitement and around 200 photos later, I return to the dining room to see if there is still dinner and to our delight service continues and they plate up our main courses. After dinner I head back to the panorama deck to catch the sunset, as we are now back in latitudes where the sun sets at least for a few hours. 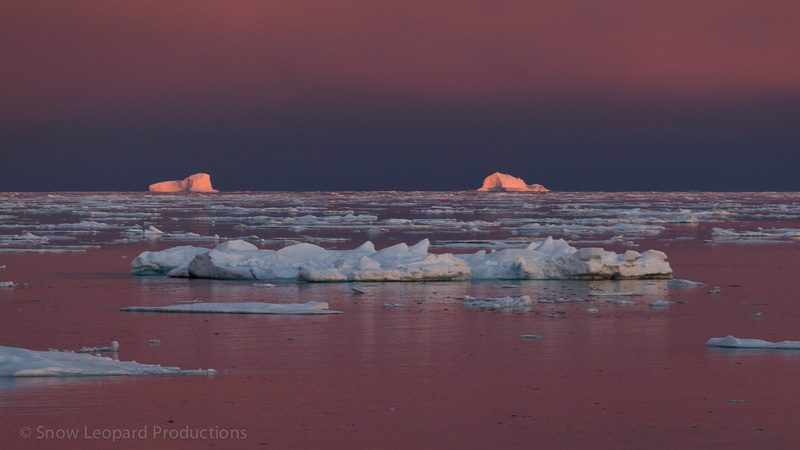 The colours are spectacular with the water turning pink, while the icebergs keep a beautiful turquoise colour that slowly fades to pale blue. I can’t stop taking photographs. But the night is still not over and it is time for our quiz night and our team consists of Barb and Sandy, Amar, Tracy, John, and yours truly and much to our surprise we win the quiz night, which then descends into one big dance party (at least for a few of us!). What a beautiful blog Sheila. It’s really bringing back fabulous memories. Thanks for the shout out. It really was a magical moment.